The new Murray Royal Hospital has been completed and handed over to NHS Tayside. There is still an issue of traffic to the new site and the potential overspill of parking into surrounding areas. The surplus land is to be sold by NHS Tayside, and development of the site raises major issues of traffic and loss of land for community use. Construction was carried out by Morgan Sindall. There is an administration Hub where which also has main reception, a cafe and an outpatients unit. There are two general adult psychiatric wards, four wards for psychiatry of old age, a Day Centre, a Low Secure Unit and a Medium Secure Unit to take patients from Carstairs High Security Hospital. The building contract began in June 2010. 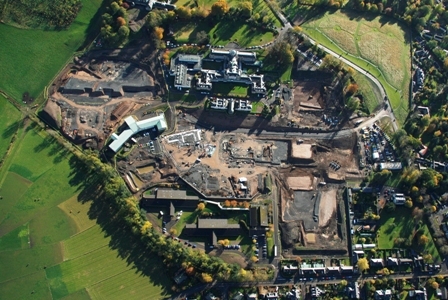 This picture shows the old hospital and the site of the new one during construction. NHS Tayside obtained outline planning consent to develop the Murray Royal Hospital, the development to be carried out by a contractor who would win the bid for the contract. The original planning consent related to only part of the site and would have meant high density buildings and loss of open space for patients. There was a further application to extend the site. While the Community Council supported the redevelopment we were very concerned about the related traffic issues. One of the planning conditions was that the detailed submission has to have a traffic plan. Taycare a Limited Liability Partnership comprising the Robertson Group and Morgan Sindall (formerly Morgan Ashurst) was chosen as the Preferred Bidder in July 2009. The Design Quality Group on which the Community Council was represented, was consulted during the selection process and was pleased with this outcome. Construction started in the Spring of 2010 and went on for 2 years. Torith carryied out enabling works but went into receivership. Ogilvie Construction Limited was appointed in its place and their work was scheduled to be completed by the end of April 2010. To avoid delay the NHS Board signed an Early Works Agreement so that Morgan Ashurst could begin to set up the sites before the contract was actually signed: putting up fencing, creating temporary car parking and access roads and stripping topsoil. The first few months were spent doing a lot of earth shifting and stabilisation works. The site was levelled by moving around earth treated with lime. Lots of trees on the site were felled, to the great disappointment of local residents. NHS Tayside say that many of the cherry trees were diseased but will be replaced once construction is completed, together with the avenue of lime trees and that more trees will be planted than have been cut down. We have been told that trees being retained will be protected to ensure they are not damaged during construction. A Travel Plan, commissioned in March 2006 by NHS Tayside, was a key element of NHS obtaining planning permission. The Travel Plan identified the difficulties of the local road infrastructure, which would be exacerbated by the proposed increase of around 200 staff at the hospital. The report set a target of a 28.1% reduction in staff car travel to be implemented prior to the opening of the new hospital premises. Despite exhortation from the Community Council, NHS Tayside deferred any action to address this challenge until a bidder was selected. We were pleased to know that Ernie Patullo (Head of Environmental Management, NHS Tayside) was asked to set up a team to analyse the latest MRH staff travel survey and to initiate appropriate actions to meet this target. As well as including NHS management and staff representatives, Graham Fleming as BGKCC representative was part of the team. Unfortunately NHS have indicated that they have no intention of meeting the target and say that it was merely aspirational. The challenge of the reduced allocation of car parking spaces for the new premises also has to be addressed. A group was set up to consider alternative uses for the redundant buildings on the site. Perth Civic Trust, Perth Chamber of Commerce, Perth & Kinross Council, Perth Public Partnership Group and Tayside Carer Support are now involved. An initial list of ideas was compiled and it was planned to refine the list, evaluate sustainable proposals and take these to NHS Tayside’s Strategic Policy and Resources committee. In the draft local plan at the time of the planning consent the remainder of the site was designated for high density housing. There was a playing field in the hospital grounds which is well used by local youngsters. Under the current plans this was lost although there is an agreement that it be replaced sometime. Traffic. There will be construction traffic during the building of the new hospital, more traffic generated by extra patients and staff plus extra traffic if housing is given the go-ahead. Bridgend junction is already at full capacity and the roads leading to the hospital are narrow residential streets. Loss of open space. The hospital grounds are of therapeutic benefit to the patients and are used by local people making the hospital part of the community and an asset for Perth generally. If there is not continuity of provision of the playing field there is a risk of youngsters losing interest and the tremendous impetus to use it disappearing. Listed Buildings. NHS Tayside have no use for these so their future is in doubt. Parking. Gannochy Road is already subjected to commuter parking and Muirhall Road is very narrow. We are very concerned about parking for staff, patients and visitors. The Community Council set up the Murray Royal Working Group (MRWG) comprising Brian Raine, Richard Salvin, Deirdre Beaton, Andrew Douglas and Graham Fleming. An information day for bidders was held and 3 bidders emerged. They were Canmore Partnership (Tayside Mental Health), John Laing/Laing O’Rourke and Robertson Capital Projects (Taycare). There were formal presentations of their plans by 2 of the bidders at 3 stages originally scheduled for April, June and September) with meetings in between to discuss design, technical, legal, financial etc. issues. The third bidder Canmore Partnership (Tayside Mental Health) dropped out at an early stage. As part of the planning consent NHS Tayside was told to consult with interested parties so MRWG has been attending meetings and reporting to the Community Council and the public. We have tried to insist that the above issues be addressed and the bidders be made aware of our concerns.A Design Quality Group was also set up. There are obviously commercial confidentiality concerns and we discussed with NHS Tayside the terms of a confidentiality agreement to be signed by the MRWG members. Meantime representatives of two of the bidders, John Laing/Laing O’Rourke and Taycare met us on Monday 7th April. We felt that the meetings were productive and that we were able to put the views of the community as expressed to us. The bidders did seem to be glad of the opportunity to find out more about these. We have had several engagement meetings with NHS Tayside although these were often cancelled or delayed. The Design Quality Group (DQG) comprised Tayside Health Board representatives (the Project Director and 3 hospital design experts; Tayside Health Arts Trust; Architect and Design Scotland enabler; Perth Civic Trust and the Community Council. Its role was to consider the fundamental design issues, to set up criteria to evaluate the designs at the 3 submission stages and to review the designs alongside the Clinical User Groups. Respecting the existing parkland site and its listed buildings and encouraging whole site healthcare only. Ensuring the designs took into account the traffic issues surrounding the development. Although Richard had to agree to be bound by a confidentiality responsibility and could only give us limited reports he could seek to safeguard or at least represent the interests of our community. He reported that both designs met the clinical needs. In his opinion one of the designs served the community better than the other on various counts, but as always in a complex equation there were pros and cons in both solutions. In general terms he also reported that both designs were of high quality, and either one when completed would make a valuable environmental contribution to this area, and be a considerable improvement on the existing fractured development that has taken place at Murray Royal over recent years. He believes the designs progressed from the initial hospital proposals being a concrete jungle shoehorned into the northern half of the site leaving the rest of the site available for housing development. However the traffic issues outwith the site eg the narrow sub standard Lochie Brae and Bridgend Junction traffic flow problems are still there and we are pursuing this with PKC. There will be Traffic Analysis Report required with detailed planning dealing with site traffic, but with no improvements carried out to the existing road network as we requested prior to commencement, major site traffic will come through and will be a disruption in the Gannochy area in particular. At an early stage of discussions with NHS and PKC planners we put forward the option of a temporary road during the construction phase but noserious consideration was given to this idea. The Bidders put forward their stage 2 presentations on 2nd July. The stage 3 presentations were scheduled for the end of July but were submitted at the end of November. The Bidders are not looking at access to the site as that is not their responsibility. We pressed the planners to look at traffic issues immediately and not to wait until an application was actually lodged but to no avail. NHS Tayside submitted a new outline planning application in October 2008 which related to an extension of the approved outline application boundary to include land to the south west, the non listed buildings next to the chapel and a sloping area of ground to the eastern edge of the site. It also included part of Muirhall Road. The bidders have considered land outwith the area in the original planning approval and the extension being sought will allow all bids to be considered equally. We are told that the revised boundary does not mean that additional facilities are envisaged or that the extended area is the preferred area for development. Plans and information are available at Pullar House, Kinnoull Street. 8.45a.m. to 5p.m. Monday to Friday (ref 08/02078/OUT). At the end of the year long Bidding Process the two Bidders left submitted their final designs. These were assessed and scored by the various groups involved and the final roundup of scores took place. The final tenders were considered by the Board the preferred bidder, Taycare being appointed. There will be a 6 month period for detailed planning, and if all goes to programme there will be a start on site early Spring 2010. Morgan Ashurst plc applied for outline planning consent for “erection of new mental health facility to replace existing hospital” on 13th September (Ref 09/1691/AMM). 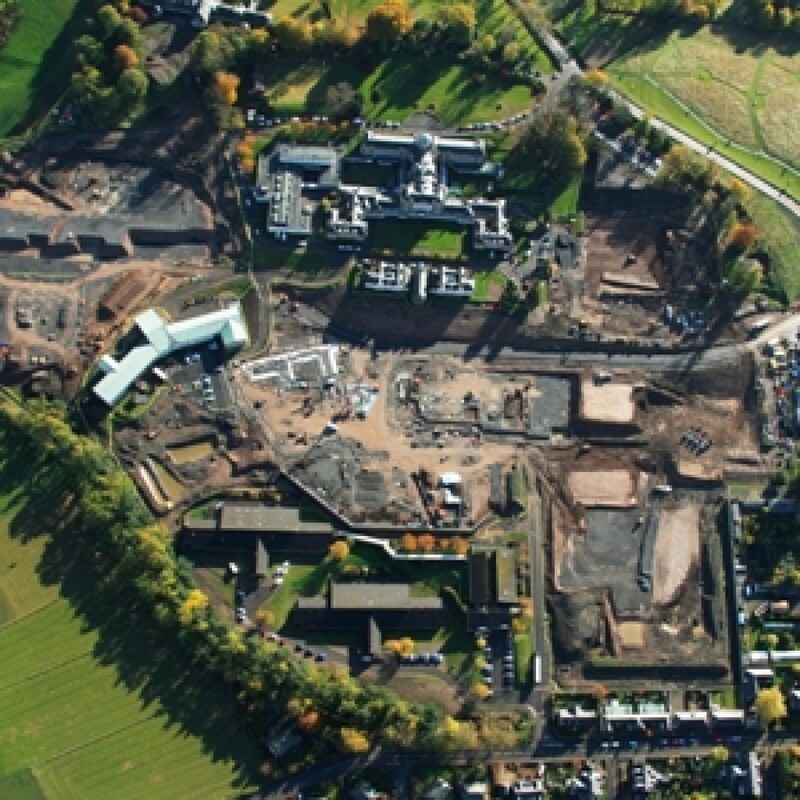 On 14th January 2009 Perth & Kinross Council’s Development Control Committee granted the application. Mr Richard Salvin spoke on behalf of the Community Council. Open Days were held on Friday and Saturday 4th and 5th September 2009 when the public could see the plans and ask questions. There were models and drawings showing what the hospital would look like. The users and carers and the nurses and doctors who worked with the architects to develop the designs for the new hospitals were also available for a chat. Planning Consent for the development was granted on 20th January 2010. An Application for Planning Permission to demolish listed villa buildings Elcho and Birnam wards was also granted but Historic Scotland did not agree to this.